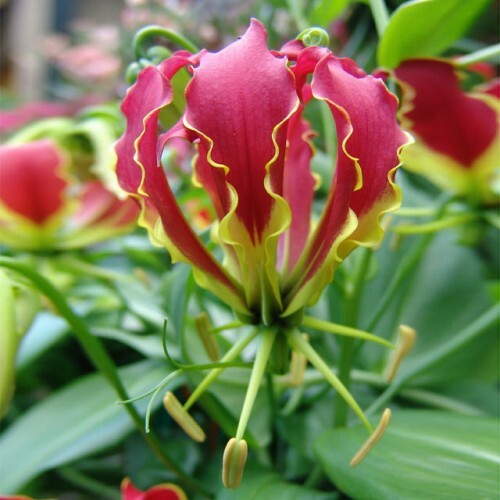 Gloriosa rothschildiana is a tropical vine which grows to 6’. Its lily-like flowers of bright red and yellow are very showy. Gloriosa lilies prefer organically rich, medium moisture, well-drained soil. They like a sunny spot but produce best blooms when placed in locations with some afternoon shade. After blooming, dig, dry and store the tubers in a dry medium before first frost. Or the other option is to leave the gloriosa tubers in pots or containers year-round: start them indoors then sink the entire container to the rim in the ground after last frost date and dig up pot and remove to a frost free location after bloom for overwintering dry in the pot. Containers may also be placed on patios during growing season. As a houseplant, locate container in a bright sunny window, with watering tapered off after bloom to induce dormancy. Watch the Botanus Garden Club video about Unusual Summer-flowering Bulbs including Gloriosa rothschildiana!